Lian Li introduced the PC-V600F, a new high-end case that will be sold for $225 (excl. VAT). 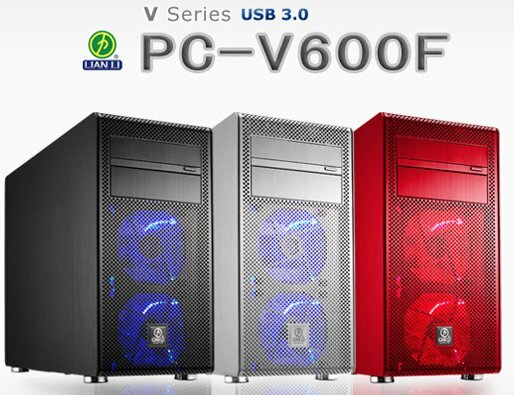 Lian Li Industrial Co. Ltd, maker of high-end, all-aluminum computer chassis since 1983, today announces a new edition to their V series of PC cases with the release of their Mini Tower PC-V600F. Available in Black, Silver, and Red, as well as All Black (internal and external), this high-quality, all-aluminum computer case sports a grated front-panel design, three cooling fans (two with LED lighting), lots of build space with hot swappable capabilities, multiple USB 3.0 ports, and all the anti-vibration and tool-less features enthusiasts know are the markings of a Lian Li design. In short, another solid PC chassis from the Taiwan-based company.